Minnie is fine. I answer to Minnie or Bess. Why did you decide to use your main character’s name as your pseudonym? Few, if any, authors I’m are of do this, preferring to keep their main characters separate, even if they use a pseudonym. I should say that I actually thought about doing this, but via a blog — our travel blog is called “Bob and Ellen’s Big RV Adventure” because I originally toyed with the idea of writing posts that were sort of true but mostly fiction about a couple solving crimes as they RV’d around the country. Instead, I went the more conventional route — true blog, fiction in the novels using Walt and Betty Rollin, who are a lot like me and my husband but also different in some key ways. Hmmm… I can’t remember which came first, the idea for the author name or the character name. I think they must have come at the same time. I think it’s adorable! And it means something to me in a personal way. 🙂 However, as I think about writing other cozy mystery series, I think I’ll have to change the name of the sleuth! Having said all that, you’ve written quite a slew of Minnie Crockwell books, so it seems to have worked out okay for you. Given you and your main character share a name, how much of your personal histories are similar? For example, if I ask when you started RVing, would the answer be the same for the author and Minnie? So when did you start RVing? What motivated you to hit the road? As I mentioned above, I bought my first RV, an older used camper, as a single mom when my daughter was 4. Sold that, moved overseas for 3 years (military), then got an assignment to Alaska. One episode of trying to tent camp (even in the summer) in Alaska was enough to send me back to the RV store for a 21-foot Class C. I haven’t always had RVs and have even tent camped since then, but I always go back to RVing whenever I can. After the Class C, I owned a fifth wheel (which we full-timed in), then two motorhomes (also full-timing). I’d love to have a Class B. We’ll see!! Are you a full-time RVer or do you have a sticks-and-bricks home base? Do you write on the road? If you write while traveling and at a home base, do your writing habits differ because of the set-up? If so, what adjustments do you have to make from one to the other? Yes, I did write “on the road,” though not on traveling days. 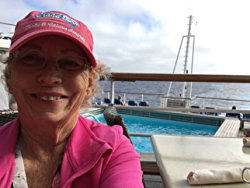 I’m probably more of a seasonal traveler because I do have to write full time, so I travel, travel, travel, then have to settle in for months to write all day. My writing habits don’t change from RV to home other than that I don’t write on the days when I’m on the road (RV, car, planes). I always want to…say I’m going to…but I almost never write at the end of an exhausting travel day. I have taken two trips by plane (to places where I had formerly RV’d) where, under deadline, I sat in my hotel room (with a view, thank goodness, of desert or beach) and wrote all day. Poor planning on my part. Writing in motorhomes is fabulous because I set up in the captain’s chair and write while I watch activities (and the view) in the RV parks or campsite. 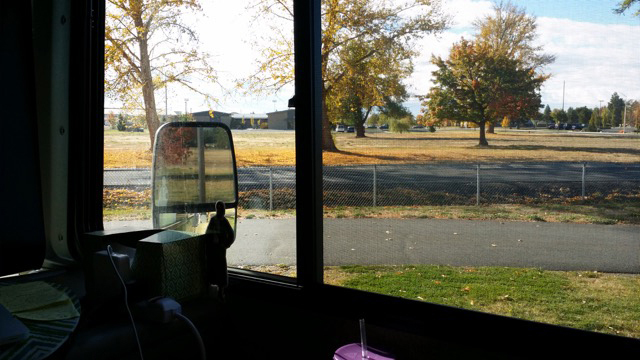 Minnie’s RV writing space — with an ever-changing view! If you’re like me, you’re bombarded with inspiration everywhere you go; the hard part seems to be sorting out what to use and what to ignore. Can you give us an example, using one of your books, to show how your process works — from the initial idea to how that idea made its way into a book? My first love is traveling, and traveling guides my inspiration. So, I almost always set my books in places where I’ve traveled to, especially via RV. Frankly, for the Will Travel for Trouble series of cozy mysteries, I pick titles and go from there. Which is very unusual for me because titles are difficult for me in my time travel romances. For instance: Hungry Horse, Montana. What a fabulously evocative (if sad) name. Had to set a story there. I love the national parks so try to pick parks with catchy names. Where’s your favorite place to travel via RV? Why? Anywhere, absolutely anywhere. I have no favorites. I love everywhere I’ve been and everywhere I’m going. There can be bad campgrounds in sketchy areas when traveling but I do a lot of research on the places where I intend to stay for a while. And with all RVers, if I don’t like it, I move on. 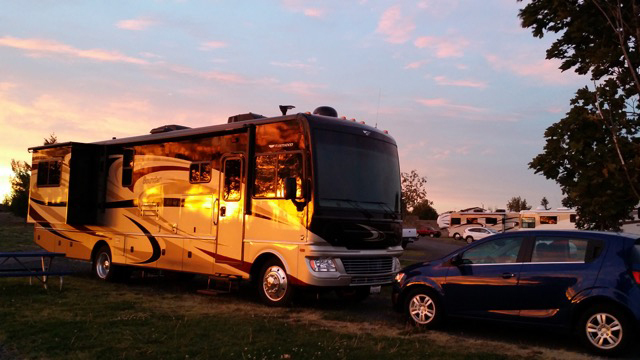 Is there any place you’d like to travel in your RV but haven’t yet? Is there anything I haven’t asked that you’d like to talk about? My web site is www.minniecrockwell.com. I’m on Facebook as Minnie Crockwell. Here is my Amazon page with all my Minnie Crockwell books listed. Thank you, Minnie! We’re all looking forward to more adventures from Minnie and Ben (and Bess!)! Thank you, Ellen! I had fun! It was great to have you here, Minnie! Let us know when you’re next book is available!